I love sleep; there’s not much to elaborate on that but I’m pretty sure you reading this do too – I’m usually in bed by 9:30, electric blanket keeping the toes from turning to ice, wrapped up like a burrito in my winter duvet (yep, it’s that time already) but there’s just a few evenings where it feels hard to switch my brain off, or my eyes are so tired it just hurts to try and sleep – the worst. Combined with disturbed sleep and you’re praying for anything to help send you off into a deep snooze all night long. Three things have helped me ease into a better sleeping pattern, all natural and all seriously enjoyable too. 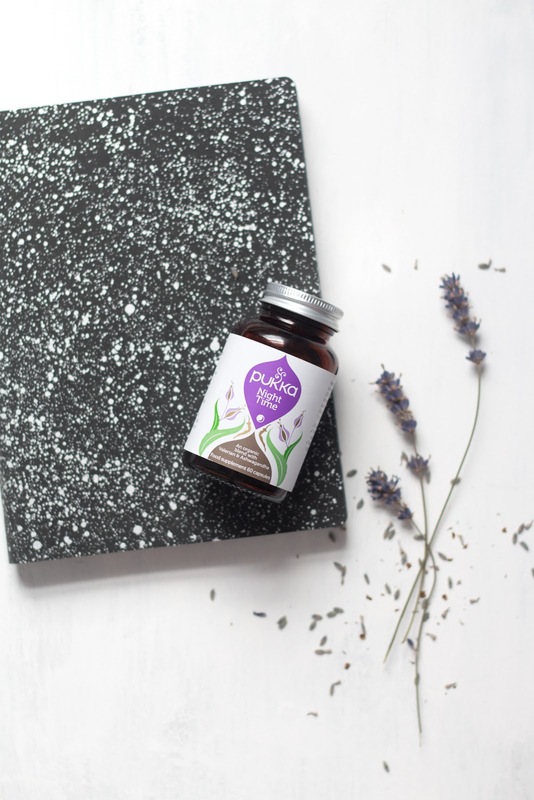 Firstly are these Pukka Night Time Sleep Capsules which seriously rock – I took two of these one night and I’ve never slept deeper, 8 hours of uninterrupted sleep is pure bliss! Thanks to the added Valerian Root, they help to basically sedate you into a calmer and less anxious sleep – something I’ve experienced a lot of in the past and now is slowly fading, phew! – and you can take them every night or as and when you need them most, but I can always guarantee a more relaxed sleep experience even when I take one in the evening to keep my mind calm. Next is meditation, and this is the one thing I rely on most evenings. I downloaded a playlist from Apple Music (Spa Music and Deep Sleep are my faves, such relaxation, head massage much needed) and just pop my headphones in whilst I do a last minute social media scroll. The music helps to slowly lull me into a calmer state, and get me fully zen in bed. I won’t lie, there’s been too many occasions where I’ve woken up with a headphone embedded in my arm because I’ve fallen asleep listening to the swirling rivers of a spa track. Painful, but worth the sleep. Finally, my sleep saviour is distraction. Now this is quite broad because there’s lots of things I do within this to help me sleep, but they all take my mind off the fear and worry of having enough sleep. Sometimes a YouTube video that makes me laugh or entertains me for 15 minutes does the trick, it tricks my brain enough that it goes into a happy state of peace, or maybe just a bit of yoga to stretch out the limbs and relax my brain (if you haven’t tried rolling on your head, you haven’t lived). The most important thing about this time before sleep is switching off, so don’t think or try to do any work, just close your eyes and let yourself experience and enjoy calm thoughts or music, and allow yourself to become a sedated plank of wood for a few hours – you’ll feel so much better and alert from it, I promise. How do you like to prepare for sleep? Have you got any mind-relaxing tips? Is your bed your best friend?